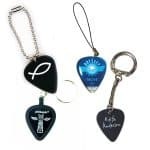 Always your own guitar pick with you, it’s possible with our Guitar Pick Keyring. It’s easy to design your own guitar pick with our Online Pick Designer tool. The picks are made of Celluloid and is therefore ideal to play guitar. You can choose from a variety of thicknesses. You can choose from these thicknesses: 0.71mm. We currently offer white guitar picks. These picks is also a full color printing possible and we can borderless printing. This allows us to give the pick all the colors you want. For best results we recommend to upload a picture of 300DPI. If you are not sure of the result? We can always make an example and check your image, it’s free.